Nothing in this exhibit room but a snare drum and a whirring fan. "Is that leak supposed to be there?" a visitor asks. Water leaks from the ceiling above the snare drum. Every few seconds, a drop forms and falls. The drop should hit the drum. You can almost hear the sound it would make. But an electric fan blows each drop off course, over the drum and onto the floor. You can't see the drop diverted. I narrow my eyes, try not to blink. I watch each drop grow full, tremble as gravity pulls it down. A spotlight catches the drop as it falls towards the drum. I don't see it again until it splatters the concrete floor. A brown, oval stain has formed around the leak on the ceiling. A puddle gathers at the foot of the drum. Where water has evaporated, minerals in the water leave amorphous white rings. Stain on ceiling, stain on floor. The invisible leak makes itself visible. Water droplets fall over and over. They can't help falling, can't help yielding to the whirring fan. The silent drum is seductive, tantalizing. If just one drop were to hit. One drop. It's possible, isn't it? The sound of water hitting the instrument as present as an echo in my head. Try to isolate another sound. Can you hear droplets smack the floor? Or is that sound imagined too? I want water to gush from the ceiling. I want to beat the snare drum with my hands. The piece becomes an orchestration of failure, of mistakes we make again and again hoping for outcomes so nearly realized. 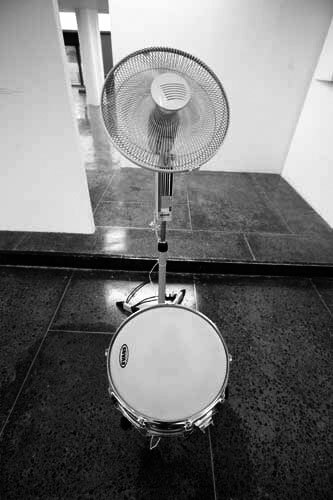 A leak, directed toward a snare drum, is diverted by the air of a fan placed next to the instrument. Fernando Ortega's conceptual works involve performative and nonperformative actions in which he recreates an event or situation that he has observed in the world or arranges a set of parameters and waits to see what will happen. All of This and Nothing is a current exhibition at the Hammer Museum.